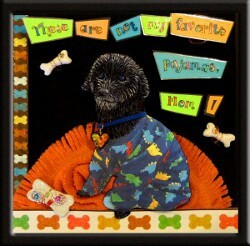 Celebrate your furry friends with a 3-D Pet Collage from Candace Jedrowicz. This free craft tutorial is fun and full of creativity. Personalize your project to fit your pet! I wanted the words stand out from the background, so I hatched a scheme. 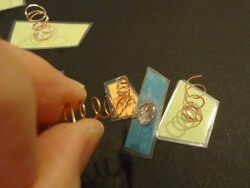 I coiled wire into springs for the back of each word. I secured the coils to the back of the words (and to the back of Conan's head) with a hot glue gun. Conan's photo looked very flat. I used a black glaze pen and a silver glitter pen to liven him up. I used clear dimensional glue to pop the eyes. There's also glitter pen accents on the dinosaur pajamas. 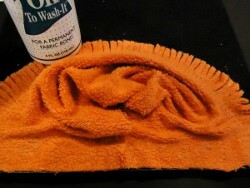 This is a piece of a fleece shirt that I fringed, scrunched and glued onto the background. I added paper trim before placing the words and the star of the show. 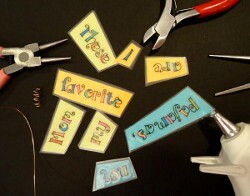 From this angle, you can see that I hot glued the words in place attaching the bottoms of the wire coils to the background. I've also added several details - a collar with a foiled polymer clay heart, polymer clay bones and a texture ceramic button bone - all wired up up with accent beads. Wow. 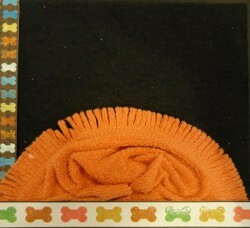 This 3-D pet collage is super fantastic. I never seen anything like it. I love the way the whole thing is done. 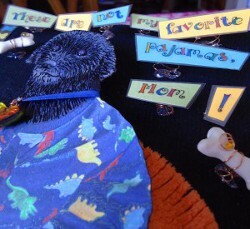 A piece of fleece fringed shirt for the rug is a great idea to give the collage some texture and some coils to raise the words for depth and the dogs head and the black glazed pen to add some color to the fur and why not make the clothes on the dog with some fabric. This will make a great gift for some one who loves their dog.So if they are had to shop for then why not give this gift of love. 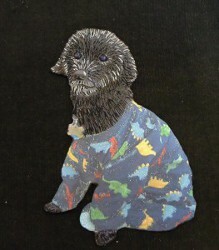 I really love this project I will be making one for each of my 5 lhasa apso dogs. We just adore them they are part of our family. And I know that my daughter will have a lot of fun working on this project with me, she really loves creating all kinds of art. Thank you so much for the idea. Oh, what a cute idea! My dogs are my life, so I really want to do one of these for all of them! Thanks for a fun idea!